One theme of the 1970s was "do it yourself' and that handyman's anthem covered everything from holistic home building to surgery to intra-personal religion to suppressor design and construction. In the realm of quieter firearms, entrepre-neurship capitalized on the kit craze in 1979. The next step was to commercialize, then mass produce the easy-to-assemble kits. Soon all sorts of do-it-by-the-numbers suppressor products appeared. Since 1980, about a dozen small companies have been formed to sell suppressor components and kits. Advertising heavily in Shotgun News and operating mostly by direct mail order, they offer all the necessary parts to build a suppressor. Interestingly. their ads have gotten personally competitive, too, and not only in price and quality. In 1982. one company was running ads that took personal swipes at a competitor's products and ethics, threatening legal action over alleged business intru sions. The other partly claimed he was a mirror-image victim of the first. Many of the kit companies opened for only an ad or two, then quietly folded back into the graveyard of failed small businesses, a sad legacy of our times. Others reorganized, renamed, and carried on. Still others were mail order ripoff artists who grabbed the bucks and ran. Most remained Ma and Pa moonlight operations. Yet, a few that opened for business at the kitchen table with a post office box became actual companies when they combined with a machine shop subcontractor. Some of them have made good money. Basically, these companies sell only component parts. Most solemnly advise in each ad that actually assembling or "activating" a suppressor requires government approval and tax payment. All send warning notices with their kits; some even furnish the necessary government forms to be filled out when the buyer applies to "activate" the device. But, few folks are fooled by this veneer of "we-just-sell-'em, we-don't-know-what-the-customers-do-with-'em" logic. Due to the varying designs and construction of the kits currently offered for sale, we can only render an opinion based on a physical examination and testing of the specific kits. Those kits which require no additional manufacturing to assemble a functional silencer would obviously be subject to the National Firearms Act (NFA) and those which require additional manufacturing steps can only be classified on a case-by-case basis. The factors which must be taken into account are complexity of operations, tools, and the time required to produce a functional silencer. However, any reasonably mediocre advertising writer could easily weasel around those ATF semantics, all in the spirit of American can-do capitalism, of course. For example, in 1981 an outfit known as R.F.P., operating out of Milpitas. California, offered an Uzi suppressor kit for sale at SI50. along with the warning. "Sold for repair or display only." 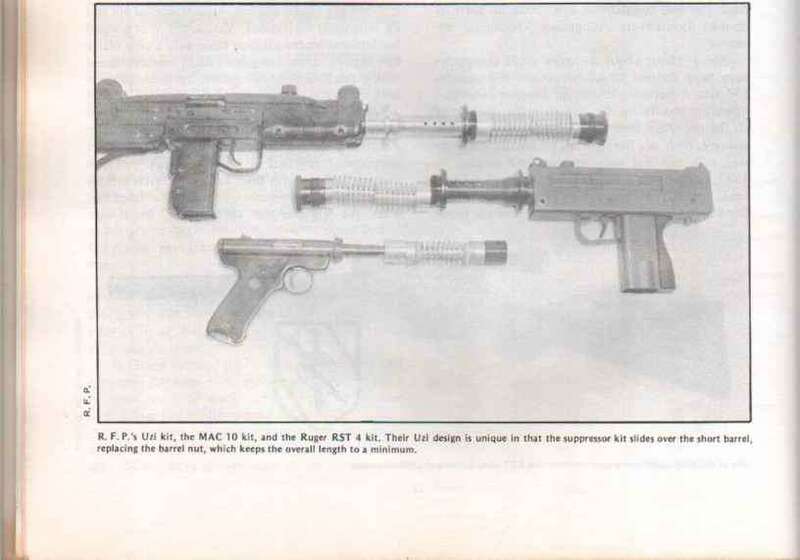 The unit was almost a duplicate of the original Sionics/MAC suppressor. They also offered kits for the MAC 10 and 11, Ruger pistols, rifles, and the AR7 at $100 each. R.F.P. 's president. 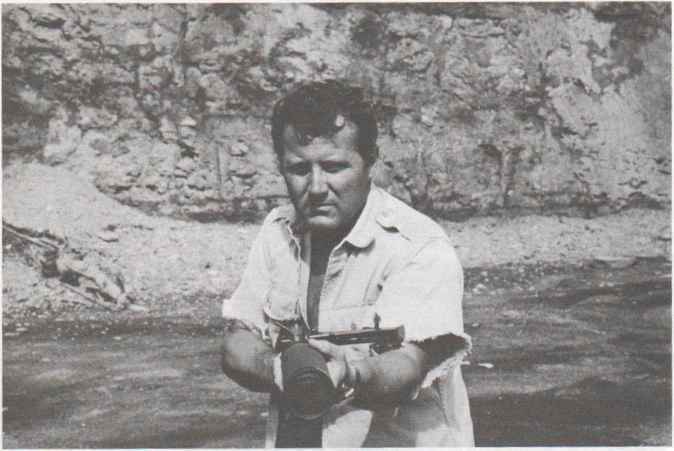 Robert F. Pierce, most recently designed a new wipe system called Encap-U-Wipe. Patent is pending. He says that this attachment will drop the dB rating another three points. All of their units, except those in .22 caliber, carry this new device. Pierce claims, "Because of the added third wipe, our kit currently has the lowest decibel rating of any sonic type kits on the market." 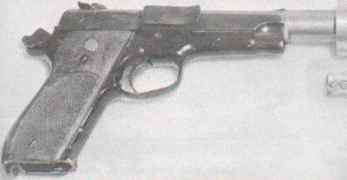 The R. F. P. mini kit installed on a S & W 39. This unit carries R. F. P.'s new Encap-U-Wipe, a new wipe design on all their sonic-designed suppressors. Do it yourself silencer for sale?